I love apples and eat them almost daily, the evidence is strong to keep up this practice, let me tell you why. Thanks to the efforts of Johnny Appleseed, apples started their climb to popularity in the late 1700’s. Now there are over 7,000 varieties on the market today odds are in your favor you will find one that you like, Red and Golden Delicious are among the sweetest apples. Braeburn and Fuji apples are slightly tart, and Gravenstein, Pippin, and Granny Smith apples are the most tart, but retain their texture best during cooking. Now on to the health benefits, research shows that the pectin in apples reduces the risk of colon cancer and helps maintain a healthy digestive tract. 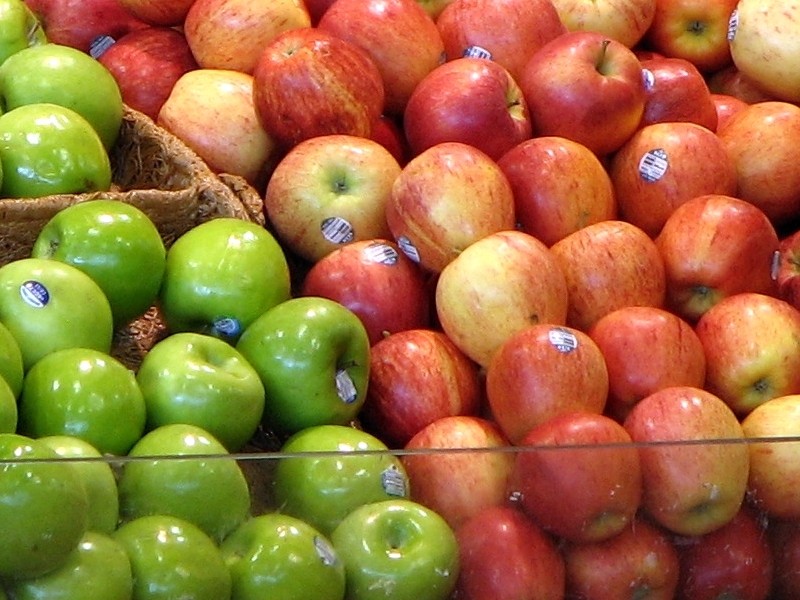 One apple provides up to 5 grams of fiber, more than many cereals. The pectin in apples assists to lower the body's need for insulin and may help in the management of diabetes. Did you know our Fiber Fit has apple pectin? Apples clean the teeth and strengthen the gums. Research shows the fiber (pectin) content and apples unusual mix of polyphenols support heart health by lowering total cholesterol. Quercetin, a key ingredient in our Immune Health, is the primary phytonutrient found in apples which is far more concentrated in the skin than in the pulp. Apples can even help a person suffering from hemorrhoids which are caused by too much pressure in the pelvic and rectal area; fiber can ease straining when going to the bathroom. I remember one time my brother and I were meeting friends at Mt. Mohunk in New York on the 50 mile drive over I got a bout of diarrhea. We were driving on country roads, no Walgreen's nearby, we stopped at a country store and my brother got me an apple while I used the restroom. He pealed the skin off for me to eat and he got to eat the rest of the apple. I can tell you the problem was solved and I didn't need to use the bathroom again. I was amazed. An apple that has been bruised or damaged will start to release ethylene gas hastening the ripening process for other fruit in the immediate area. What does that mean? One bad apple does spoil the whole bunch, ha ha I couldn’t resist. If you are not purchasing organic fruit you may find your apples are waxed, wash them thoroughly in warm soapy water, then rinse well before eating. According to the Environmental Working Group's 2011 report apples are among the top 12 foods on which pesticide residues have been most frequently found. I hope you will be encouraged to have an apple today. It can help from top to bottom.